Perhaps one of the most unique looking flowers I have ever come across is the Anthurium flower. A favourite of tropical flower themed weddings this almost artificial looking bloom (it looks like shiny plastic, until you touch it) are a great option for the bride looking for something different. 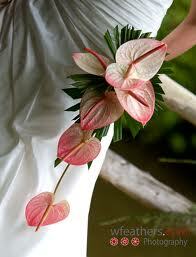 The Anthurium flower is a tropical flower originating from South America, and is used in tropical themed wedding floral decor. Featuring a wide flat leaf like “petal” Anthurium is probably most recognizable in it’s potted houseplant form. A true tropical flower with a shiny waxy appearance the Anthurium is large and offers a unique texture to floral arrangements. It’s sculptural quality lends itself well for use in cascading style bouquets with other tropical flowers such as orchids, tropical leaves etc. 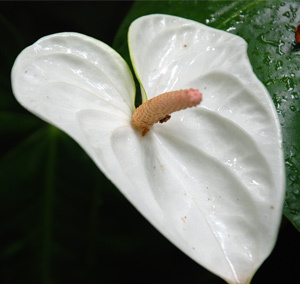 The Anthurium is available all year round as it is field grown in the tropical climates of Queensland, Hawaii and South America, as well as greenhouses. The most common colours are red, pink and white with different colour gradations on the petal, but both green and brown varieties can also be found. 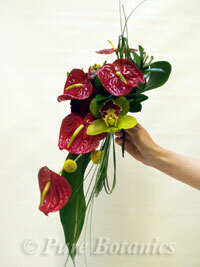 Due to it’s tropical origins, the Anthurium flower must be kept in a warm temperature so refrigeration is a huge DON’T! For inspiration on wedding themes and styling contact us today for design consultation. With all the tools Brides have online to help plan their wedding there has been a huge surge in Do It Yourself Weddings. Pinterest posts step by step instructions, Youtube gives you a full video and the local craft store is filled with print your own, make your own wedding related products. For the crafty bride this means a lot of fun and creativity (and an opportunity for a girls night with your bridal party). For the budget conscious bride this seems like the answer. Not the same thing. I myself am a crafty person. I have a degree in fine art and studied both art history but also the practical side of painting, sculpting sketching etc. So I am a great candidate for making something for a wedding. I am detail oriented and good with my hands. Some brides are like me and will thrive making DIY invitations or favours. Some brides, however, are not. The danger with DIY is that if you are not a wedding professional you have never done the project before. You have no idea how long it will take you. Chances are it will take you at least twice as long as you think. Not exactly a stress free scenario. You can imagine how frustrated you will get when your “easy as 1, 2, 3” invitations get eaten by your home printer. Not fun. But the above example for invitations is for something that is done months in advance of your big day. Something like flowers has to be done a few days before. Can you imagine the level of stress you would encounter if it was two days before your wedding and you couldn’t get your bouquet to look the way you want it to?! Not only would you likely relent and give up on the project, but now you will have to rush to florist and pay a rush charge for whatever flowers you can get your hands on. Months and months of planning gone down the drain and you’ve probably lost some of your hair. You wouldn’t try to fix your carburetor if you weren’t a mechanic right? You take it to a pro, so that you know the job will be done right the first time and delivered to you the way you expect. The same goes for your wedding pros. It may seem like doing it yourself will save you money, but once you factor in your time, gas, retail pricing and lack of knowledge and skill leaving it to those who do it everyday is by far the better way to go. You also won’t end up paying for things twice because you messed up your version first and THEN hired a pro. Trust in the experts who deliver exceptional quality for the best price. Contact us today for your design consultation. I figured I’d start a weekly entry dedicated to one popular wedding flower to give a little more in depth information. So I’ll start with A and try to go through to Z, without using flowers that no one has ever heard of. This is one of my favourites because it’s one of the few flowers that works for a black and white colour scheme! This fact makes it a popular request for bridal use alone, but it also comes in a variety of other colours. I will be featuring the Anemone in a few of the bouquets in the Total Wedding Show at the International Centre this coming weekend so come on by and see this gorgeous flower up close and personal! The Anemone is a member of the buttercup family and closely related to the ranunculus flower. Resembling a poppy (also in the buttercup family) in appearance, the Anemone produces a single large flower in white, blue, purple, scarlet or crimson. Most varieties have dark centers, though the white variety can have green centers as well as black. 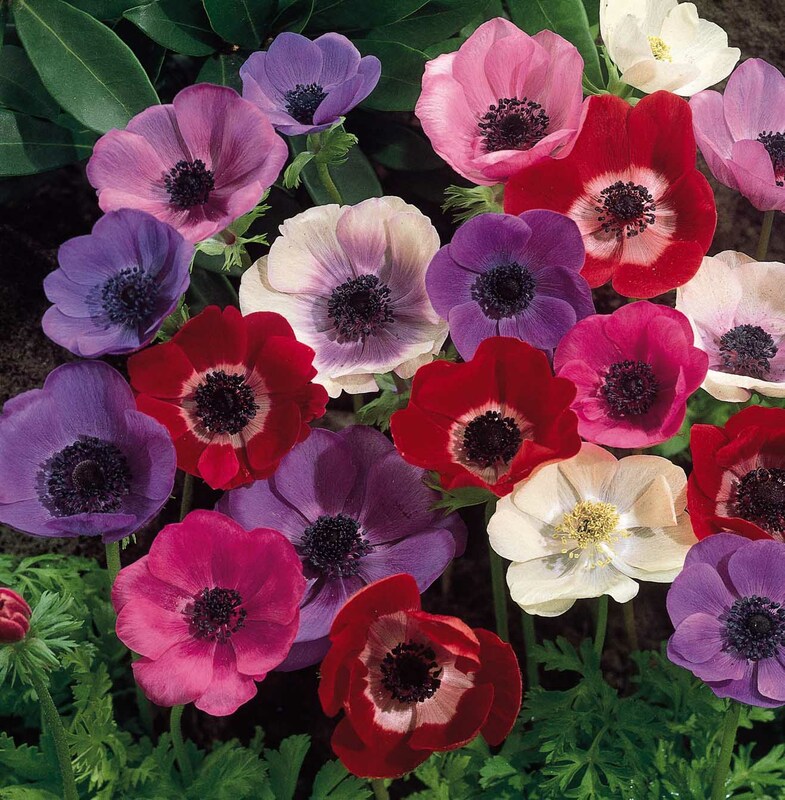 Available from early spring through into early winter the Anemone is grown primarily in fields in Australia, though it originated in China and the Eastern Mediterranean. Considered a “accent flower” the Anemone is priced mid range and is a lovely addition to bouquets and centerpieces. Using it as the special touch in an arrangement with other flowers will keep your costs to a minimum but still allow you to show case the beauty of this flower. Cautions: Anemones are ethylene sensitive so be sure to keep them away from fruit, car exhausts and cigarette smoke. 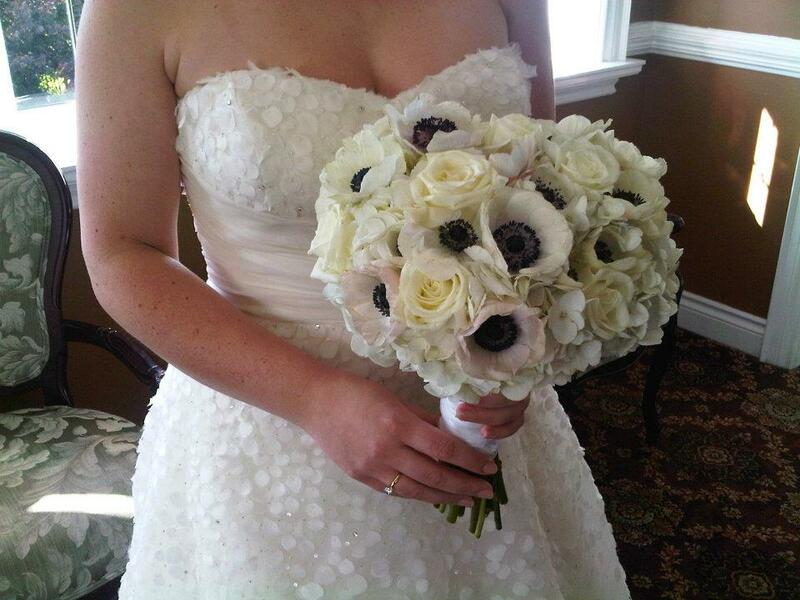 For ways to use Anemones is your wedding flowers contact us today for a design consultation.